The Hirshhorn Museum and Sculpture Garden is an art museum beside the National Mall, in Washington, D.C., the United States. 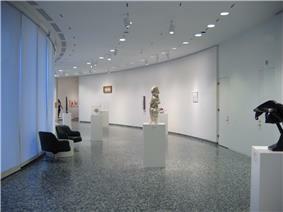 The museum was initially endowed during the 1960s with the permanent art collection of Joseph H. Hirshhorn. It was designed by architect Gordon Bunshaft and is part of the Smithsonian Institution. It was conceived as the United States' museum of contemporary and modern art and currently focuses its collection-building and exhibition-planning mainly on the post–World War II period, with particular emphasis on art made during the last 50 years. Notable artists in the collection include: Pablo Picasso, Henri Matisse, Mary Cassatt, Thomas Eakins, Henry Moore, Jackson Pollock, Mark Rothko, Franz Kline, Hans Hofmann, Morris Louis, Kenneth Noland, John Chamberlain, Francis Bacon, Willem de Kooning, Milton Avery, Ellsworth Kelly, Louise Nevelson, Arshile Gorky, Edward Hopper, Larry Rivers, and Raphael Soyer among others. Outside the museum is a sculpture garden, featuring works by artists including Auguste Rodin, David Smith, Alexander Calder, Jeff Koons and others. The building itself is as much of an attraction as anything inside, likened by many to a large spacecraft parked on the National Mall. The building is essentially an open cylinder elevated by four massive "legs," with a large fountain occupying the central courtyard. Before architect Gordon Bunshaft designed the building, the Smithsonian staff reportedly told him that, if it did not provide a striking contrast to everything else in the city, then it would be unfit for housing a modern art collection. Meanwhile, Joseph H. Hirshhorn, now in his forties and enjoying great success from uranium-mining investments, began recreating his collection from classic French Impressionism to works by living artists, American modernism of the early 20th century, and sculpture. Then, in 1955, Hirshhorn sold his uranium interests for more than $50-million. He expanded his collection to warehouses, an apartment in New York, and an estate in Greenwich, Connecticut, with extensive area for sculpture. 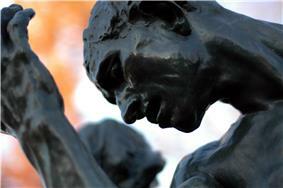 The Burghers of Calais at Hirshhorn Sculpture Garden (closeup). A 1962 sculpture show at New York's Guggenheim Museum awakened an international art community to the breadth of Hirshhorn's holdings. Word of his collection of modern and contemporary paintings also circulated, and institutions in Italy, Israel, Canada, California, and New York vied for the collection. President Lyndon B. Johnson and Smithsonian Secretary S. Dillon Ripley successfully campaigned for a new museum on the National Mall. 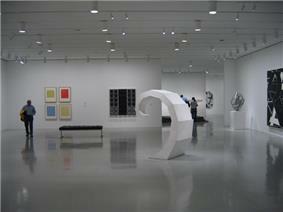 In 1966, an Act of Congress established the Hirshhorn Museum and Sculpture Garden, Smithsonian Institution. 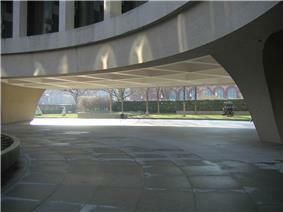 Most of the funding was federal, but Hirshhorn later contributed $1-million toward construction. 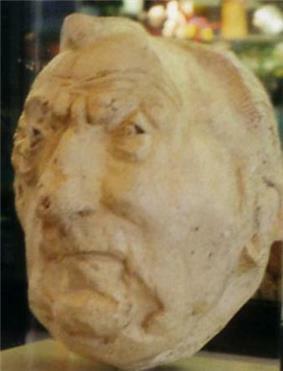 Joseph and his fourth wife, Olga Zatorsky Hirshhorn, visited the White House. The groundbreaking was in 1969. Abram Lerner (born 1913) is named the founding Director. He oversaw research, conservation, and installation of more than 6,000 items brought from the Hirshhorns' Connecticut estate and other properties to Washington, DC. In 1984, James T. Demetrion, fourteen-year director of the Walker Art Center in Minneapolis, departing in December 2007. Chief Curator and Deputy Director Kerry Brougher served as Acting Director for more than a year until an international search led to the hiring of Richard Koshalek, who was named the fifth director of the Hirshhorn in February, 2009. Koshalek (born 1942) was president of Art Center College of Design in Pasadena, Calif., from 1999 until January 2009. Before that, he served as director of The Museum of Contemporary Art in Los Angeles for nearly 20 years. At both institutions, he was noted for his commitment to new artistic initiatives, including commissioned works, scholarly exhibitions and publications and the building of new facilities that garnered architectural acclaim. He worked with architect Frank Gehry on the design and construction of MOCA's Geffen Contemporary (1983), a renovated warehouse popularly known as the Temporary Contemporary. He also worked with the Japanese architect Arata Isozaki on the museum's permanent home in Los Angeles (1986). Yoko Ono’s Wish Tree for Washington, DC, permanent installation in the Sculpture Garden (since 2007), has become very popular with contributions from all over the world. 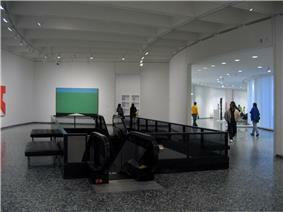 In 2007, the Hirshhorn began hosting After Hours Parties three times a year. These events quickly became extremely popular as a way for the museum to give a venue to underground and avante-garde local artists, allowing itself to be turned into not only a night club, but a club where the art on the walls is the real deal. In 2009, Hirshhorn After Hours collaborated with The Pink Line Project, where the Pink Line Project hosted the VIP Lounge. In 2009 it was announced that an inflatable structure would be erected over the Hirshhorn's central plaza to create a new public space. The Seasonal Inflatable Structure, to be called the "Bloomberg Bubble," is due to be erected in 2013 and will be inflated annually for one two-month period. It will create a 14,000-square-foot space for performance and lectures. It has won a progressive architecture award from Architect magazine. 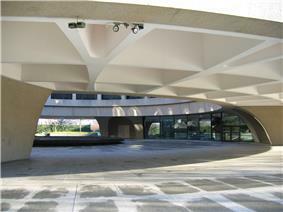 Hirshhorn officials began reconsidering the Bubble in 2013. Construction cost estimates for the structure more than tripled to $15.5 million from $5 million, and no major gifts for the project were received between 2010 and May 2013. A Hirshhorn study also concluded that the cost of programming (such as symposia and special events) using the Bubble were likely to run a $2.8 million annual deficit. 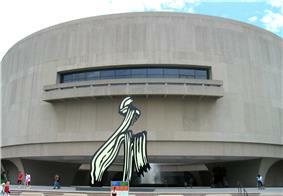 The Hirshhorn's board of directors evenly split on a vote to proceed with the project in May 2013. In the wake of the vote, seen as an endorsement of his leadership, museum director Richard Koshalek announced he would resign by the end of 2013. Constance Caplan, chair of the museum's board of trustees, resigned on July 8, 2013. She cited what the Washington Post characterized as "a board, a museum and the larger Smithsonian Institution at a crossroads, roiled by a lack of transparency, trust, vision and good faith". Four of the board's 15 members resigned between June 2012 and April 2013, and three more (including Caplan) in May, June and July 2013. On June 5, 2014, Hirshhorn trustees announced that they had hired Melissa Chiu, director of Asia Society Museum in New York City, to be the Hirshhorn's new director. Chiu, who was born in Darwin, Australia, is an internationally known scholar of contemporary Chinese art who championed "new media", video installations, and photography at the Asia Society. 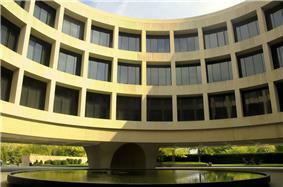 Chiu will oversee the Hirshhorn's 40th anniversary celebration in the fall of 2014. 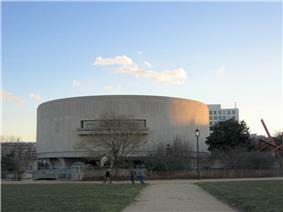 Chiu begins her tenure at the Hirshhorn in September 2014. 1971. Amid this climate of controversy, Bunshaft's original conception for the Sculpture Garden-an elongated, sunken rectangle crossing the Mall with a large reflecting pool-is abandoned. He prepares a new design based on an idea outlined by art critic Washington Star article. The new adaptation shifts the garden's Mall orientation from perpendicular to parallel and reduces its size from 2 acres (8,100 m2) to 1.3 acres (5,300 m2). The design is deliberately stark, using gravel surfaces and minimal plantings to visually emphasize the works of art. "The whole complex has been designed as one composition... Bunshaft's design is not concerned with the grandeur of the Mall. It is concerned with the greater grandeur of his museum and it gives us an awful lot of beaux-arts pavement and pomposity that no longer seem to suit the taste and style of our times." [Preliminary design criticized] Wolf Von Eckhardt, The Washington Post, February 6, 1971. "The circular plan is not only clear, but also provides a pleasant processional sequence that goes a long way.... The fortress quality of the Hirshhorn suggests some rather obvious thoughts about the nature of housing art in our time. But the building's architecture... is less the product of a desire to make a statement... than it is a logical progression in aesthetic development.... " Paul Goldberger, The New York Times, October 2, 1974. 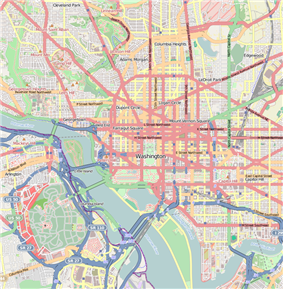 "[The building] is known around Washington as the bunker or gas tank, lacking only gun emplacements or an Exxon sign... It totally lacks the essential factors of esthetic strength and provocative vitality that make genuine 'brutalism' a positive and rewarding style. This is born-dead, neo-penitentiary modern. Its mass is not so much aggressive or overpowering as merely leaden." Ada Louise Huxtable, The New York Times, October 6, 1974. "The parched severity of [the original Sculpture Garden] was not without merit, but the appeal was more to the mind than to the senses, more theoretical than practical.... The new design reinforces the identity of the garden as a welcoming urban park.... [This] park for art...serves the sculpture. The divisions of the space prove essential accents; artworks pop in and out of view as the spectator moves about the space...." Benjamin Forgey, The Washington Post, September 12, 1981. "[The Hirshhorn is] the biggest piece of abstract art in town - a huge, hollowed cylinder raised on four massive piers, in absolute command of its walled compound on the Mall.... The circular fountain...is a grand concoction...that for good reason has become the museum's visual trademark." Benjamin Forgey, The Washington Post, November 4, 1989. ^ Maura Judkis (March 23, 2012). "Hirshhorn ‘Bubble’ to be called Bloomberg Balloon". Washington Post. ^ May 23, 2013.Washington Post.Parker, Lonnae O'Neal. "Hirshhorn Director Plans to Resign After Board Splits on 'Bubble' Project." Accessed 2013-05-24. ^ July 10, 2013.Washington Post.Parker, Lonnae O'Neal. "Constance Caplan, Chair of Hirshhorn Museum Board, Announces Resignation." Accessed 2013-07-10.